Spam is on the increase. Or it’s on the decrease. To be honest, it’s rather difficult to say which direction spam is going in because it’s continually variable. And because frankly, it is not an interesting topic to worry about (and I used to produce a daily graph of the amount of spam I received for over 5 years) in that level of detail. It is definitely true there is a lot of it; probably far more than you realise. Most email sent on the Internet is spam (there are statistics out there but they are wildly variable), so the surprising thing is not that you sometimes get spam in your inbox (or your spam folder) but that there is little of it! How old your email address is. If you have had an address for a long time you will get more spam than if it has been newly created. How much you use your email address on web sites. Many web sites are known to sell list of email addresses onto spam criminals. How well publicised your email address is. If your email address appears on a web page anywhere, it will attract spam. One obvious strategy to reduce the amount of spam you receive is to avoid using and publicising your email address. Which rather defeats the purpose of having an email address in the first place! Spam is just spam. An annoyance and something we could do without, but it seems to be one of those inescapable annoyances of modern life. And usually we only see the tip of the iceberg. Google protects your inbox. If you have several hundred spams in your inbox right now, it won’t seem like it, but it does. The details of the anti-spam mechanisms are either not public, or are rather too technical to go into here, but there are basically two levels of defences. Firstly Google will block emails from arriving that it is certain are spam. These spam emails don’t get delivered; they don’t even get accepted for delivery. Secondly, Google will attempt to classify the emails that it does accept to determine whether it has accidentally accepted spam. There are anywhere up to thousands of potential tests – whether an email is in HTML without a text part, whether it consists of just an image, whether it lacks certain email headers that are normally present, etc. 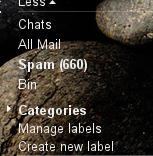 That’s what my “Spam” folder looks like right now. Your folders may well look quite different. Don’t confuse this with your “Junk Mail” folder – which I commonly do! If it’s invisible, consider whether you really need to see it. If the word “show” next to the System label “Spam” is shown in blue, click on it. The contents of this folder should be considered to be potentially dangerous, offensive, etc. There might be some legitimate email in there, so you are free to look through the contents to see if some has been misclassified. If you ignore your spam folder, any of the contents older than 30 days will be removed. Unfortunately anyone can send email to you if they know your email address, and that includes people whose tastes include material that is offensive to you (and in many cases nearly everyone). There is not anything more that can be done about this sort of material for our domain; Google already blocks most spam from reaching your inbox and classifies most of the remainder as spam (and files away from your Inbox). You can of course hide the Spam folder (see above). Can’t You Block The Sender? Cost the University a lot of money; blocking one sender is cheap of course but everyone will want to block their spam senders. That’ll be thousands per day. Be completely ineffective as senders change on a frequent (sometimes multiple times per second) basis. There is no point in blocking a sender address that will never be used again. Of course if you have an abusive sender, IS will be happy to block that sender. If you think you have discovered an anti-spam technique that Google doesn’t already know about, you are welcome to write up an academic paper so that Google can use your technique. There is a lot of expertise at work in the anti-spam area and has been for years. Unless you are already a researcher working in this area, it is likely that you have come up with an idea that has already been considered. And What Is The “Junk Mail” Folder? Earlier I mentioned that it is possible to confuse the “Spam” folder with the “Junk Mail” folder. If you do not have a “Junk Mail” folder, you can ignore this section! It is probable that if you did not create it yourself, the “Junk Mail” folder is an artefact of the migration from GroupWise (a predecessor to Google Mail). You can probably delete it safely. But the key fact that Google does not use the “Junk Mail” folder automatically. This entry was posted in Email and tagged Email, Google, Junk Mail, Spam. Bookmark the permalink.